Establishing a dialogue between two bodies of work by different artists is not an easy task. When both share common aesthetic values, plastic and conceptual interests may still go separate ways. Even then, such provisions do not guarantee two bodies of work will be antagonistic. Herein lies the challenge: to identify stylistic shades, creative principles, and formal choices to better analyze the work as a space which serves to reflect the artists themselves. When these common spaces exist and they are able to found, the bodies of work can maintain their individualities and also become a set, which in turn, creates a dialectical synthesis that enriches and empowers them both. Luciana Levinton uses architecture as the foundation for her works. The Grand Palais in Paris and the historic Whitney Museum (now Met Breuer, New York), inspired a series in which she sketches facades, delineates floor plans, blurs interiors, and decontextualizes architectural elements to recreate precise figurations of architecture and bring viewers into a journey of the unknown. Strident combinations of short and long brushstrokes create phantom-like images of what can be identified as buildings, though not yet fully defined. 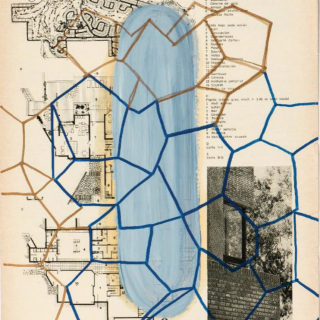 The same journey applies to Levinton’s works on paper, which consist of brightly colored geometric shapes superimposed on top of architecture magazines from the 70’s. In these smaller works, colorful abstractions invade lines of text and floor plans on old pages and use them as a guide for compositional support. Viewers recognize two elements, one from the past and one from the present, as they coexist to create an aesthetic that is inherent and unique to Levinton’s work. Alejandro Thornton’s works in acrylic on canvas and ink on paper address space from yet another perspective. The identifying characteristic throughout his entire body of work is a quasi obsessive repetition of the letter A. Thornton’s goal is to raise the letter to near iconic status; however, the overall aesthetic makes his attempt paradoxical as his use of repetition produces abstract webs comprised of infinite combinations of ‘A’. At once the letter becomes a module, which can be repeated ad infinitum to create a network of images that is necessary for Thornton to capture the viewer's attention. Both artists begin working with easily recognizable figures only to create abstractions without spatiotemporal references. Levinton eliminates redundant information, while Thornton uses repetition as his mantra. In the case of each artist, dependence on a monochromatic color scheme synthesizes their distinct bodies of work to become a tertiary element in an otherwise binary exhibition. Levinton and Thornton know how to delineate a path within the visual arts. Constructive language, conceptualization and composition become the foundational elements from which each builds their practice. To establish connections between the two is a fine observation task that makes sense of the exhibition proposal at hand. In Traverse, two intelligent points of view which question themselves come together and reflect Levinton and Thornton from a common area.